There are 98 Assisted Living Facilities in the San Mateo area, with 27 in San Mateo and 71 nearby. The average cost of assisted living in San Mateo is $4,710 per month. This is higher than the national median of $3,346. Cheaper nearby regions include Foster City with an average starting cost of $4,166. To help you with your search, browse the 218 reviews below for assisted living facilities in San Mateo. On average, consumers rate assisted living in San Mateo 3.9 out of 5 stars. Better rated regions include Burlingame with an average rating of 4.1 out of 5 stars. Caring.com has helped 7 families in San Mateo find high-quality senior care. To speak with one of our Family Advisors about assisted living options and costs in San Mateo, call (855) 863-8283. The population density in San Mateo, California is 3,526 percent greater than the California average. Seniors in the San Mateo area can choose from there 64 assisted living communities, with 26 located right in San Mateo and the remaining 39 in surrounding areas Alameda, Belmont, Foster City and Redwood City. In San Mateo and throughout California communities that provide assisted living services to senior citizens are officially known as Residential Care Facilities (RCFs). 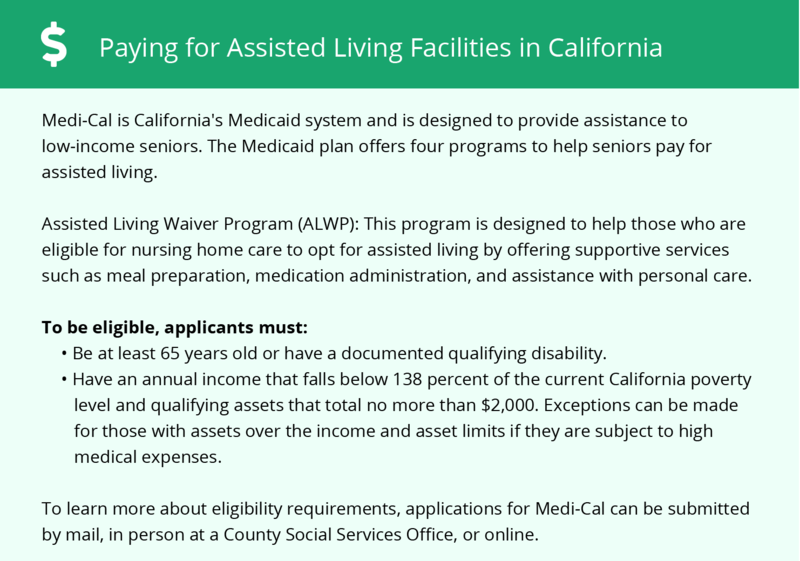 These facilities are licensed and regulated by the California Department of Social Services' Senior Care Licensing Program. San Mateo's cost of living is extremely high. The overall cost of living in the city is 169.4 percent higher than the national average. This is reflected particularly in housing costs, but can also be seen in expenses such as groceries, health care and transportation. The weather in San Mateo is comfortable year-round. The city usually has no snow and minimal rainfall each year with an average high of just over 63 degrees in the warmest months of the year and approximately 48 degrees in the coolest months. Although the summer highs are below the U.S. national average of 72 degrees, the lows are considerably higher than the national average of 32.23 degrees. Crime rates in San Mateo are low when compared with the state median. Residents have only a 1 in 426 chance of becoming a victim of violent crime and a 1 in 48 chance of becoming a victim of property crime. State median rates show that residents have a 1 in 225 chance of becoming a victim of property crime and a 1 in 39 chance of becoming a victim of property crime. The San Mateo area is home to world-class medical facilities, including San Mateo Medical Center, in case of medical emergencies or illness. SamTrans offers a safe public transportation option with reduced fares for seniors. The state of California doesn't tax social security income. Seniors may be able to use these savings to help pay for costs associated with assisted living. Assisted Living costs in San Mateo start around $4,710 per month on average, while the nationwide average cost of assisted living is $4,000 per month, according to the latest figures from Genworth’s Cost of Care Survey. It’s important to note that assisted living rates in San Mateo and the surrounding suburbs can vary widely based on factors such as location, the level of care needed, apartment size and the types of amenities offered at each community. 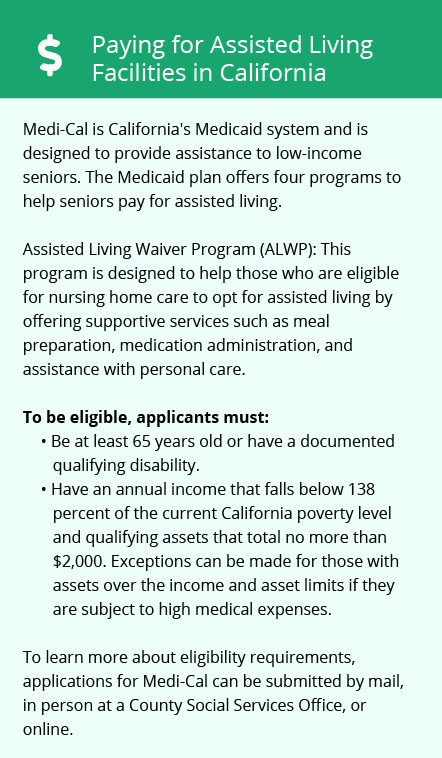 The Medicaid 1915(c) Assisted Living Waiver helps eligible seniors in California pay for services provided in residential care facilities, while an optional supplement (OSS) to Supplemental Security Income (SSI) is available to help with room and board costs. Residential care facilities are not permitted to charge room and board fees to Medicaid eligible seniors that exceed their combined SSI and optional supplement less a personal needs allowance of $131 per month. To see a list of free assisted living resources in San Mateo, please visit our Assisted Living in California page. San Mateo-area assisted living communities must adhere to the comprehensive set of state laws and regulations that all assisted living communities in California are required to follow. Visit our Assisted Living in California page for more information about these laws.